Peripheral Artery Disease is a common circulatory problem in which narrowed arteries reduce blood flow to your limbs. When you develop peripheral artery disease (PAD), your extremities – usually your legs – don’t receive enough blood flow to keep up with demand. This causes symptoms, most notably leg pain when walking (intermittent claudication). Peripheral artery disease is also likely to be a more widespread accumulation of fatty deposits in your arteries (atherosclerosis). This condition may be reducing blood flow to your heart and brain, as well as your legs. Less commonly, the cause of PAD may be blood vessel inflammation, injury to your limbs, unusual anatomy of your ligaments or muscles, or radiation exposure. A proper diagnosis is vital to proper treatment. Often, you can successfully treat peripheral artery disease by quitting tobacco, exercising and eating a healthy diet. However, your PAD may be the result of other factors. Dr. HoomanMadyoon, a leading California interventional cardiologist, insists on correctly identifying the primary and secondary causes of your problem. It’s “job one” of the comprehensive The Madyoon Method. or infections progress and can cause tissue death (gangrene), sometimes requiring amputation of the affected limb. The following factors may increase chances of getting P.A.D. Smoking & Diabetes: People who smoke or have diabetes are at the greatest risk of developing P.A.D. physical activities. Secondly. 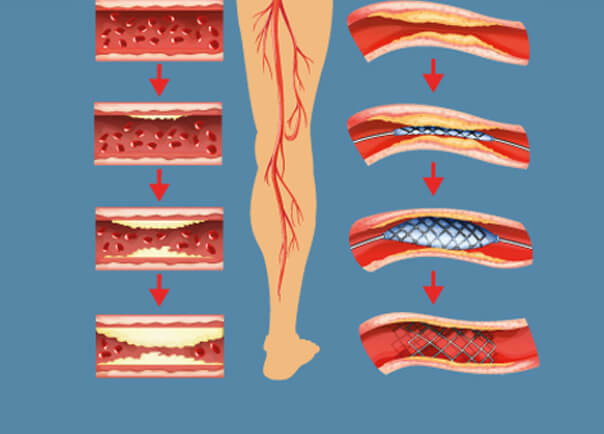 Stop progression of atherosclerosis throughout your body to reduce your risk of heart attack and stroke. do to reduce your risk of complications. If lifestyle changes are not enough, you need treatment.. Dr. Madyoon, one of the nation's leading and respected interventional cardiologists, may prescribe medicine to prevent blood clots, lower blood pressure and cholesterol, and control pain and other symptoms. Cholesterol-lowering medications. You may take a cholesterol-lowering drug called a statin to reduce your risk factor of heart attack and stroke. 100 milligrams per deciliter. The goal is even lower if you have additional major risk factors for heart attack and stroke, especially diabetes or continued smoking. High blood pressure medications. If you also have high blood pressure, Dr. Madyoon may prescribe medications to lower it. The goal of this therapy is to reduce your systolic blood pressure to 140 mm Hg. or lower and your diastolic blood pressure to 90 mm Hg. or lower. If you have diabetes, your blood pressure target is under 130/80 mm Hg. Medication to control blood sugar. If you also have diabetes, it becomes even more important to control your blood sugar (glucose) levels. Dr. Madyoon will explain to you what your blood sugar goals are and what steps you need to take to achieve these goals. Medications to prevent blood clots. Because Peripheral Artery Disease is related to reduced blood flow to your limbs, it's important to reduce your risk of blood clots. A blood clot can completely block an already narrowed blood vessel and cause tissue death. Your Dr. Madyoon may prescribe daily aspirin therapy or another medication that helps prevent blood clots, such as clopidogrel (Plavix). effects are rare with this medication. Supervised exercise program In addition to medications, Dr. Madyoon may prescribe a supervised exercise training program as part of the comprehensive Madyoon Method to increase the distance you can walk pain-free. Regular exercise improves symptoms of PAD by a number of methods, including helping your body use oxygen more efficiently. Cardiac prevention and intervention is at the center of The Madyoon Method. Our business is identifying risk BEFORE a more serious problem is allowed to occur. fundamentally change cardiology. For the first time, this amazing new science allows us to advise our Madyoon Method patients if they are at risk of having a heart attack. authority in the field! We continue to present and add original research to major cardiovascular meetings. As a result, our work has been published in many prestigious cardiovascular journals worldwide. is the leading killer of both men and women in the United States. Many more people could survive or recover better from heart attacks if they got help faster. symptoms of a heart attack can develop suddenly. However, they also can develop slowlysometimes within hours, days, or weeks of a heart attack.